The Öhlins 48 mm front fork fully loaded with the TTX22 cartridge kit inside. 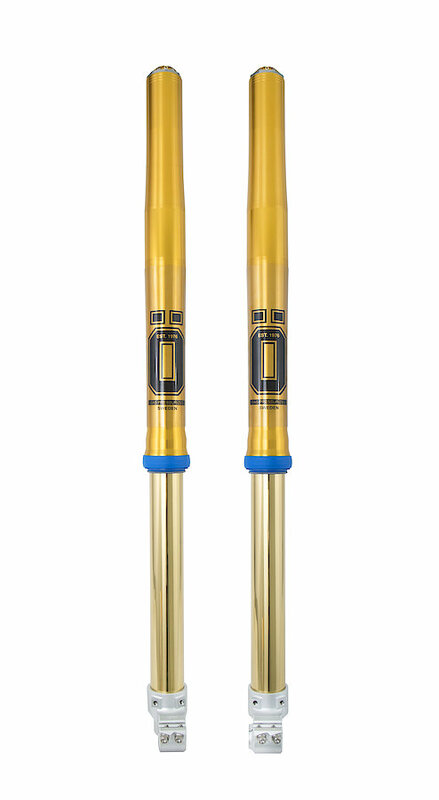 The Öhlins 48 mm front fork is loaded with the latest Öhlins front fork technology. The main piston performance in the cartridge kit inside is overall better thanks to the springs fitted to the kit, and the inner tubes has a titanium oxide treatment. Riders will experience less fading as the seals fitted works to prevent this and there top out noise is minimized due to the top out rubber used. The check-valve unit helps the fork to stay up in stroke without feeling too hard, which also improves the overall performance of the front fork. 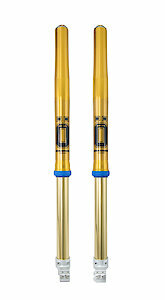 The front fork has been designed so it is hard enough to resist stones but is still solid enough to prevent corrosion. The front fork also comes with protective stickers for the outer tube to protect the outer tube all way up to the lower clamp.